Biofilms are increasingly being recognised as the preferred mode of growth of microbes in a wide range of habitats. Biofilms have a large and varied role in human activities from being responsible for a number of diseases in humans and animals to also being invaluable in the treatment of domestic sewage and industrial wastes. Biofilms aims to be the most important forum for the publication of articles on biofilms and the journal of choice for researchers in the biofilm field. 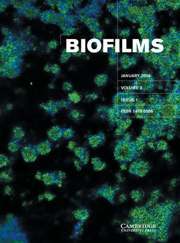 Published quarterly, Biofilms contains original research articles and review articles covering the structure, formation and growth of biofilms, gene expression and transfer in biofilms, human and animal diseases involving biofilms, biofilms in the food, oil and pharmaceutical industries, biofilms associated with soil, water, waste treatment, corrosion and marine environments. It also publishes reviews of books and websites and contains announcements of interest to the biofilm community.